In team sports, like AFL and NRL football, it was once believed that the best defensive team in the competition would win the premiership. However, statistics reveal that while a good defence in the competition (a team in the top 8 of lowest scores against) was important during the season, a very good offence (in the top 4 teams for scoring points) is necessary to win finals and in particular to win the Grand Final. The same can be said of pest control strategies in domestic and commercial situations. While a strong defence is important, a good offence is also needed to win against pests such as termites. In the old days of AFL and NRL football, offensive tactics included the violent 'taking out' of the best opposition player with a 'king hit' behind play. Likewise, in the past, a 'king hit' of highly toxic chemicals was used to take the 'best' or strongest termites out of play. In the worlds of football and pest control the rules have changed. The use of the 'king hit' and highly toxic chemicals are both considered harmful to humans and consequently they have been banned. These days only low-toxic chemicals and tactics are used by reputable Pest Controllers in their defence and offence against the destructive behavior of termites in homes and buildings. Today the use of chemical barriers and treatments by reputable Pest Controllers involves the use of chemicals with low-levels of toxicity to mammals, ensuring low risk to families, pets, wildlife or the environment. 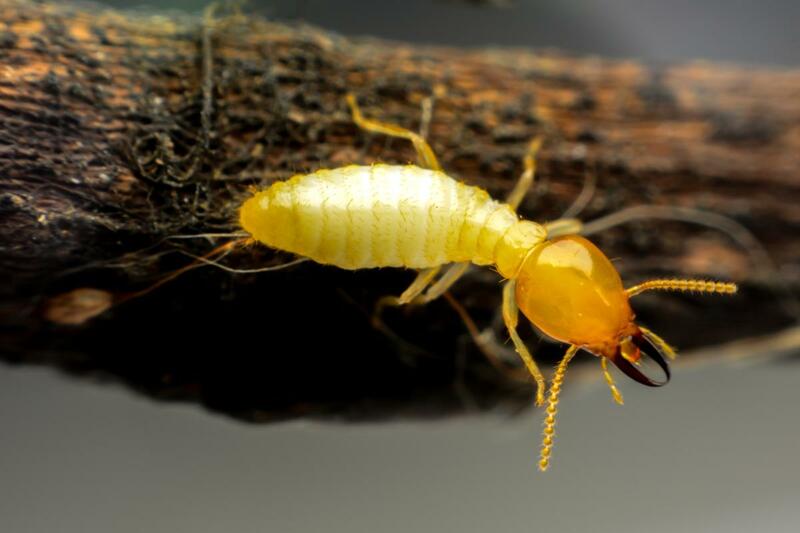 Sixteen of the 306 species of termite in Australia can be damaging. It is estimated that 1 in 4 Australian homes will be attacked by termites at some time. 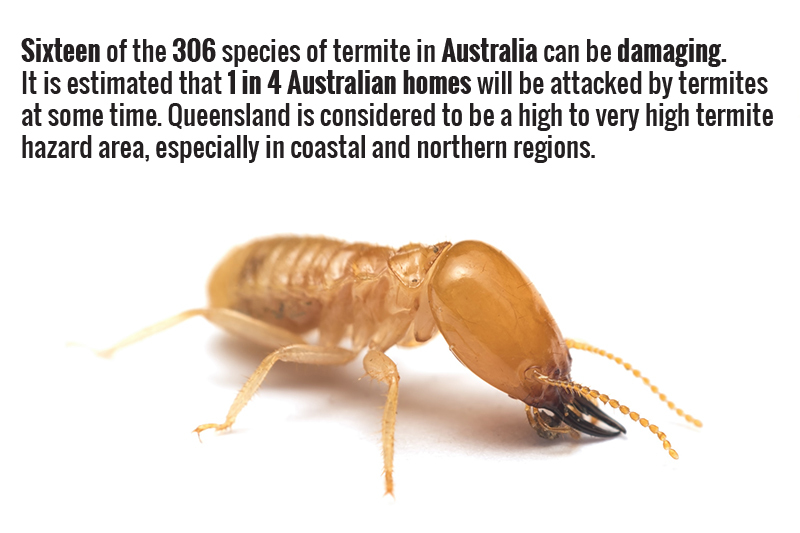 Queensland is considered to be a high to very high termite hazard area, especially in coastal and northern regions. Often termites are not detected until significant damage has been done to houses and buildings because of a termite's clever use of subterranean tunnels to travel from the nest to a 'forage' site and their unseen activities beneath the timber's surface. Professional pest controllers, such as Tony's Termites and Pest Control – Gold Coast, conduct termite inspections and recommend methods to eradicate termites and reduce the risks of termite attacks through termite management options and systems. Tony's Termite inspections involve the use of non-destructive and non-invasive Thermal Imaging Cameras and Moisture Meters to track potential signs of termites. Termidor Treatments can last about 8 years and are safe for your pets and family. The active constituent is Fipronil which has been used on pets for flea control for over 15 years. Termidor will not cause damage to the microorganisms in your soil, or your plants. "Termidor starts working immediately and has provided 100% control of infesting termites in three months or less after treatment"
Termidor's transfer effect has the ability to destroy termite nests. Physical barriers are used where subterranean termites are known to present a potential risk of attack to buildings. Regular checks of sites for termite activity are recommended. The HomeGuard Precision Termite Management System is a range of building products that are homogenously impregnated with Bifenthrin, a leading termiticide. The sheeting products are a patented single layer, extruded polymer that provides termite protection for the design life of the building when installed according to the instructions. Homeguard is Australian made and manufactured for the construction industry. HomeGuard products are made from high quality polymers that are designed to withstand the rigours of construction whilst being completely non-invasive, non-leaching and environmentally friendly. 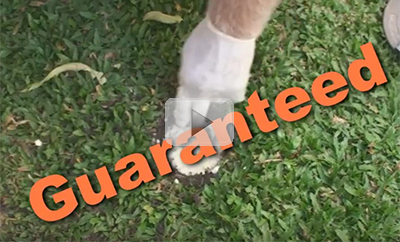 Baiting systems are designed to interfere with the growing process of termites. The systems need to be monitored and replenished. "The elite EXTERRA Termite Interception and Baiting System, with its unique Termite Interception Zone™ encircling your home is THE ONLY baiting system that creates a complete Termite Interception Zone around your home." Unique Termite Interception Zone protects your home. Quality Controlled System with bar-coded Stations. FOCUS Termite Attractant draws termites into the Station. It's important that your baiting system can be inspected - the Exterra patented solution allows easy inspection without disturbing termites and is less toxic than salt. Tony's Termites and Pest Control - Gold Coast use offensive tactics and defensive barriers that are low in toxicity to ensure you can win the Grand Final and celebrate a Premiership in your game against 'Team Termite' without risking the health of your family, pets and wildlife. Building Code of Australia (BCA), Queensland Building and Construction Commission (QBCC) and New South Wales (Office of Fair Trading) authorities require strict adherence to laws in regards to Termite Management Systems.